Are you uncomfortable handling large, hyperactive, or seemingly aggressive dogs? Did you know that if you’re unaware of how the dog perceives every interaction, you could be giving unclear or conflicting cues which can cause him to become confused, fearful, and even aggressive? 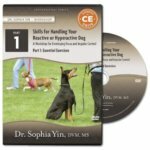 Learn the Low Stress Handling® techniques that will allow you to provide clear direction and hence have good control to improve both your confidence in handling and the dog’s confidence in you. Recognize how every interaction — even how you guide the animal from place to place — affects the animal’s perceptions of your, his level of fear and frustrations, and his willingness to cooperate. Practice exercises that will teach you how subtle differences in posture, speed, and direction of movement dramatically affect your ability to provide clear direction. Learn how to skillfully move dogs into position in a way that gives clear guidance, thereby increasing the dog’s confidence in you and decreasing his confusion and anxiety.